I got home around 5, ran to the store for some protein for dinner, and got to work. Simultaneously, I was working on 3 bean salad (which is really 2 beans plus a couple of beets), pickled beets and cabbage (the cabbage was left over from 2 weeks ago), dinner (salad, potatoes with onions and dill), and dilled carrots. I don't have enough counter space or pots for all of this! A few things to crow about: The bean salad includes 2 small peppers from my garden! The salad included tomatoes, red and yellow, from my garden! Whee! 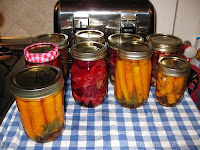 The bean salad, pickled beets and dilled carrot recipies all came from 3 consecutive pages of the Ball Complete Book of Home Preserving, but I made a few alterations. The obvious one was that the 3 bean salad has beets, and different proportions of the rest of the veggies. Plus fava beans instead of lima beans, which I precooked this time since last time I used fava beans they were tough. I then took the leftover pickling solution, strained out the mustard and celery seeds, and used them with pickling spice to flavor the beets, and added more vinegar, water and sugar with the spices to make the beets (to which I added cabbage, another alteration). Since I didn't have garlic, I used some of the funny onions instead for the dilled carrots, and used the green parts of the dill since I didn't pick the flowers. I'm sure it will be fine. Suffice to say I was cooking until 11 pm. I even managed to slip the carrots in for the last 10 minutes of the beet processing time, which allowed me a little rest. I still have a lot of greens left over for meals this week. Wait, are you pickling the cabbage with the beets or separately? Sauerkraut? 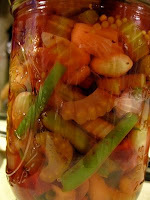 my book doesn't have a pickled carrot recipe... is it simply amazing? Because I may have to get your book! To Meadowlark: I have no idea if the pickled carrots are good - have never tasted them. But the book is generally pretty reliable. (It's also nice because it has a troubleshooting section.) How'd the interview go?